On July 31st, the Arbitration and Mediation Center of the Ecuadorian American Chamber of Commerce (AMCHAM) held a breakfast conference to analyze the Organic Administrative Code (COA), which has special items related to Intellectual Property. This activity was supported by ASIPI and the Ecuadorian Association of Intellectual Property (AEPI) represented by its President Johanna Aguirre who is also National Delegate of our Association for Ecuador. The Conference was attended by more than 50 participants, and was focused on discussing the general terms of said legal instrument, and in particular, to discuss what will happen in the future with the Intellectual Property processes. 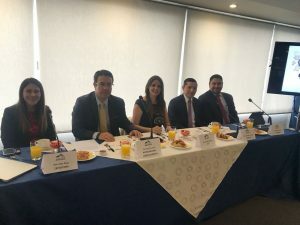 The event was attended by known speakers, Dr. Santiago Cevallos, General Director of the National Service of Intellectual Rights (SENADI), and two specialists in administrative law, Dr. Libia Rivas and Dr. Gabriel Galán.